Here is my first design- I hope you all will enjoy my designs, Im bringing a unique style for more modern style coin designs. some of the specs in the art have been changed to make the best quailty/show coin possible and still working towards a finished product. I wanted to get this thread started to get some reactions to my design, and I will give more infos tonight after work and answer questions some may have.. hope you like it. quick edit to say ,,yes it will be trackable.. so dis-regard that on this first draft of art. I hope you will realize this coin! Is it too early for reservations? That is gorgeous! I might just have to get me a couple of those. Whoa!! Well done! I'd love to see these made! We love this coin DJ.J.Rock, we are exceted to see this coin when it comes to life. It is going to be stunning, we have that feeling. Keep up the good work, and congrads on your first geocoin. I would be interested in one of those! Not sure where you are int he design process. But if the blocks around the G on the front had different texture for each ring or alternating texture that might look good. oh yeh, gorgeous — stargate!!! can't wait to see the samples or coins for this design. 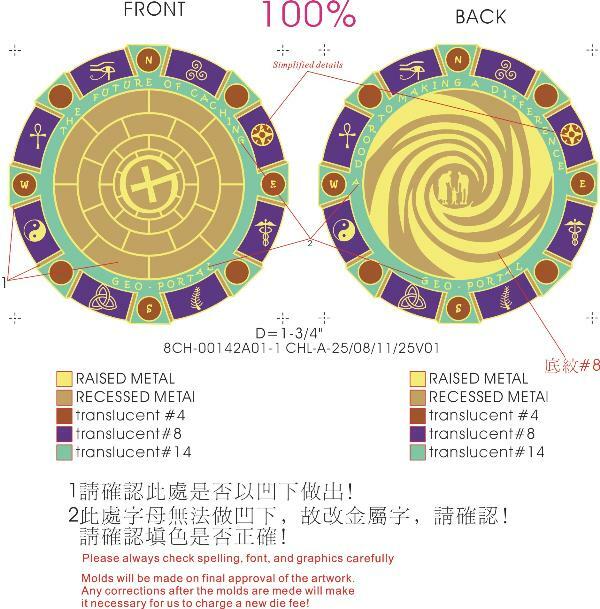 Wow -- Very nice coin design! Great job, I would definitly want one of these!!! This design certainly has potential to be lovely DJ.J.Rock! Die cast will give you the best results and some of your detail will need to be proportioned size-wise to be appreciated. It looks like it could/should be a few levels, textures and angles. Platings? I can see a few creative possibilities here for platings! You'll get a better idea of the proportions once it's rendered in Illustrator (or similar) with the appropriate line thicknesses and you can shrink it to live size. We look forward to seeing how this turns out! Well done!! Also, expect that the mint art will need many reviews/revisions before you approve any samples to avoid costly mistakes. I will be gettinmg a few. I agree with all the comments! Great work for your first design. I think the people on the second side will need to be larger to get the detail right. I will definitely be interested in watching the progress of this coin. Great concept...can't wait to see more. That's a beauty. I'd like to have one also!!! Great design. I'll be in for a few on this one as well. WOW! This looks like it will be a great coin! Can't wait to see how it turns out. Beautiful coin...I'll be waiting for your big announcement...the coins are here, the coins are here! For a better balance, in mind at least, I would rather see Geo-Portal evenly across the top and the other phrases along the bottom curve. Seems easier to read that way as well. awesome! I wish I had the talent to design something this nice.... I'll keep and eye out for one of these for the collection! Yes!!!! The Stargate!! one of our favorate series, weve spent of many night togeather watching it,, I started to think how cool it would be to portal to a cache in another world, thats where this coin comes from, also caching was a big part of being so close to my lil one, and you have to take a step to make that difference, so this coin is very meaningful to me and our family!! each symbol has a meaning and all symbols have been or are well knowen. Im not sure if the coin will have a presale or take reservations. but I will refer to this thread and send out a e-mail to each and everyone who wants one when the sales or reserves go up, as a nice gesture for supporting me and my ideas. right now we are looking at a sandblast for the brick to give them that real look of a brick and the texture too! we are looking at all options to create the best coin possible, nothing is ruled out,, we are looking at multi plating as well,, I thank you for your advice,, and your support. due to design issues with the mint the multi angle edge had to be flush with the rest of the coin to get the detail we wanted from the icons, I felt like it was a small trade as the icons are a very important part of this design and needed to be clear instead of shrunk because of the multi angle edge,,..
have learned a ton from the beginning of this project, bare with me as I continue to learn- in hopes of bringing you many more designs. I will be posting quite a bit in this thread, to keep you all on your toes and will post a die art in the next few days. so please check back for updates often. Out of this world! I'd like one, especially if it's my key to caching in new worlds. I'm not sure what it's called, but there is a dark nickel (not black nickel) that looks sort of smokey brownish and it's very shiny... it think it would be the perfect choice for this coin! Mark me down for one (or two). WOW ALOT OF COINS WENT UP FOR SALE AT THE SAME TIME I POSTED THIS,,, MABIE BAD TIMING ON MY PART....? How far are you from getting this to the mint?? YOU MAY NEED TO KEEP AN EYE ON THIS THREAD....? If you mint it we will buy! Have you thought about a two-toned metal on this coin? Since coins always look better in hand, then in the drawings, I know this coin is going to be fabulous! Put our name on your email list. YES AND YES I WILL!! THANK YOU FOR YOUR SUPPORT!! I WANTED TO POST THIS BEFORE THE WEEKEND SO EVERYONE COULD HAVE A GOOD CHANCE TO RESPOND. CAN YOU GUESS WHATS BEING CHANGED ON THIS DIE ART? HUMM? Nice work really. This is a coin for my husband fiabus. He likes the serie. Will most certain try to get one or two. changing the Geo-Portal on the back to Trackable at geocaching .com.......looking great, DJJ... . Seeing lots of artwork in my time and you being a fellow Colorado cacher I hope yo don't mind me asking and making a few comments. 1. The artwork from the mint dose not indicate there af differnt level other than raised and recessed. For the areas in purple that I think you want recessed and filled need to be incidated as such. For example the levest level would indicate 3 the next level 2 and the top level 1. It might by somewhar I just don;t see it here. 2. Do you want the letting to be placed the way they are or should the base of the letter always be toward the inside of the coin and not up and down. Tough to explain without a picture, send me an email if you want me to explain this one furture. 3. Tracking info and nubmer. Assuming DaFrongs is correct on the tracking info, where is the number going? If it is on the edge there will not be much room with the recessed notches from each side. If it doesn't fit there try one of the swirls in the protal. 4. Speaking of swirls and portal. 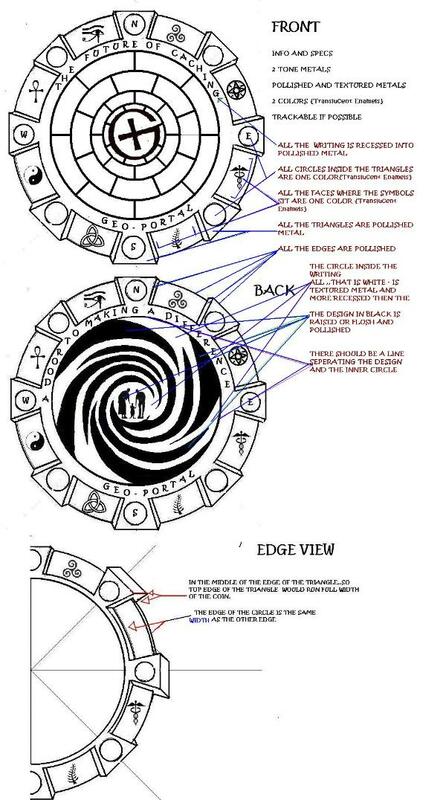 The you make then and/or the family 1/2 recessed or level 2 they might look like they are comming through the portal a bit more. Ok...I'll stop. Sorry if this was to much. ilyk?? << whats that mean? Ha- I thought it meant "I Like"